MOE: Crock! Then fill crock with hot water. CURLY: Hot water! Hotsy totsy! After the boys mix the ingredients, Moe continues: “Put in three cakes of yeast.” He orders Larry to add the yeast, but Larry is called away to the phone. Consequently, Moe adds the yeast himself. When Moe is also drawn away to the phone, Larry returns to the brew and adds the three cakes of yeast as previously instructed. Curly also adds the yeast when Larry leaves the kitchen to grab the beer bottles. However, Curly doesn’t bother to first remove the paper wrapper from the cakes, and he throws the shopping bag into the crock for good measure. One assumes that there were additional steps to the recipe, but we’ll never know, because the Stooges were too distracted contending with the overflowing, yeasty mixture to continue reading the instructions. One final note--After bottling the beer, be sure to keep the bottles far away from heat or an open flame, because Panther Pilsner Beer is highly explosive. Hello! Ever visited Peterman's Eye? Today's discussion is on cocktails...drink up! I like this review. 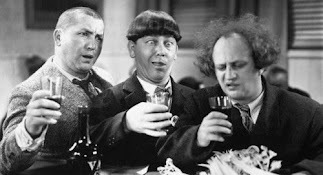 It took me years to appreciate the, "Stooges." I finally started finding them funny after seeing, "Disorder in the Court." THE BEST YEARS OF OUR LIVES is one of the few classic films that I've never seen from start to finish. I have seen parts of it, and it is on my "to watch" list. Another movie i don't see on your list is SOME CAME RUNNING, 1958, directed by Vincente Minelli. There is plenty of booze going down in that one. Check it out, you might like it. I once saw it a theater and afterwards half the audience went to the bar across the street! I will put a link to your blog on my blog, which unlike yours has no central theme, just random interests.